Food Not Bombs is growing in West Africa. It is an exciting time where students are working hard to build a strong grassroots movement dedicated to non-violent solutions to social problems and striving to build democratic organizations using the nonhierarchical approach called Formal Consensus. 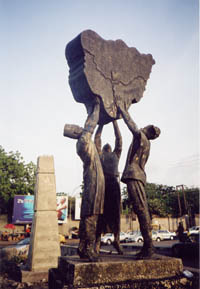 Since Food Not Bombs co-founder Keith McHenry first visited Nigeria in October 2005 the movement has started in Lagos, Abuja, Port Harcourt, Calabar and in many other communities. Food Not Bombs is not your typical Non Governmental Organization (NGO) but is a local self directed movement organized by Africans to provide solutions for Africans. The Food Not Bombs movement is starting in Africa at an exciting time where new ideas spread quickly, new national constitutions and democratic institutions are emerging. You can support this exciting new era by making a contribution for seeds, cooking equipment and transportation. 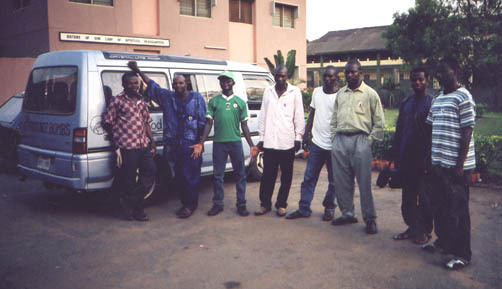 The student report on Food Not Bombs NANS tour of Nigeria from February 15th through March 7, 2006. INVISIBLE CITIES - "Nigeria's Inferno" or "Suffering inferno"